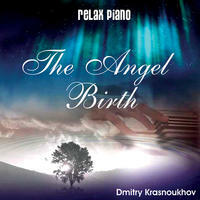 Dmitry Krasnoukhov : The Angel Birth. The Angel Birth is a travel from reality into a beyond-the-reality World. On waves of terrestrial elements - wind, water, sun, we shall transfer ourselves to the Worlds of Origin. The image of the angel under my fingers on piano keys has become the real angel that was born in these Higher Worlds. Her destiny depends on us. Whether we shall grow fond of Her, whether we shall remember Her and ask for help... You see the angels are always ready to help, it is their work. Their help - rest in our souls, clarity in our consciousness, love in our hearts, simplicity and openness in our relationships. Be happy!